The Netherlands continues to be the premiere bicycle-friendly country and sets a very high bar for US aspirations. 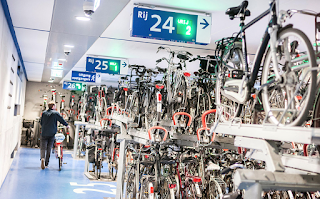 The Economist reports that a new underground bicycle park at the Utrecht Central railway station, which opened last year, is three stories deep, has electronic monitors indicating where spaces are available, and has room to park 7,500 bicycles! The national government’s latest bicycling plan, released last month, envisions spending €250 million ($293 million US) to the end of 2022 on new paths and parks. The aim is to lure 200,000 motorists to switch to cycling and to increase annual bike travel by 3 billion bicycle-kilometers (1.86 billion miles) in 2027. The Netherlands has roughly three times the population of the DC metro area, but imagine what could be accomplished if the region devoted $97 million to news paths and parks over the next four years. Definitely a “reach,” but with your help and support, FABB will be working hard with like-minded groups across northern Virginia to move local government and businesses to provide more and better bicycle infrastructure. Please volunteer or donate now, so we can continue our advocacy to make bicycling better in Fairfax and the region.